Emmett McGuckin's last-gasp goal snatched Derry a 1-18 to 1-17 Division Two victory over Kildare but Fermanagh lost 1-14 to 0-9 away to Cork. Chris Healy's goal helped Kildare lead by five at half-time but eight straight Derry points - including four James Kielt scores - put the home side ahead. Kildare appeared to have regrouped to lead by two but right at the death, McGuckin stabbed home the winning goal. Niall Coakley hit Cork's first-half goal as they bossed against Fermanagh. After a convincing opening win over Down, Pete McGrath's Ernemen have lost their last two games and now appear to be facing a battle to avoid the drop rather than chasing a Division One place. Kildare went into the Celtic Park contest heading Division Two after opening wins over Meath and Cork and the Lilywhites will wonder how they managed to failed to win Sunday's contest. In contrast, Derry, hammered by Meath two weeks ago, were bottom of the table after Down's win over the Royals at Newry on Saturday night. Aided by a strong first-half wind advantage, Kildare dominated the second quarter and Healy's goal on the stroke of half-time after good work by Neil Flynn, appeared to have the visitors in control as they led by five at the break. However, Derry used the elements brilliantly after the restart with Kielt swinging over four superb long-range points and Carlus McWilliams also notching a couple of fine wind-assisted scores. Kildare appeared to have wrested back control as four successive points - including scores from Flynn and Niall Kelly - helped them lead by two as the game went into injury-time. 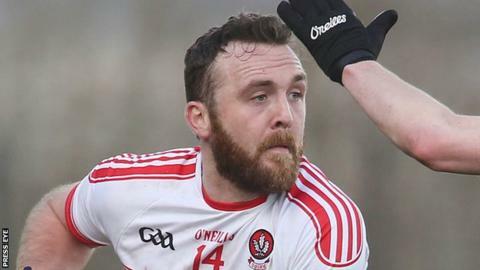 But Derry were not finished and McGuckin scrambled in the winning goal in the final play after Kildare keeper Mark Donnellan had only been able to parry a Ryan Bell shot. Fermanagh never led at Pairc Ui Rinn as Peader Healy's side controlled the contest. Coakley's 23rd-minute goal helped Cork lead 1-7 to 0-4 at half-time and Fermanagh could get no closer than five down in the second period as Thomas Treacy had to make a great save to deny a second Rebels goal for Paul Kerrigan. Tomas Corrigan, Ryan Jones and Aidan Breen were among Fermanagh's scorers but it was a very disappointing display by Pete McGrath's charges.